Safety is the most important requirement of all production and engineering. Whether it is manual operation or automatic operation, safety must be prioritized so that the most economical and efficient work can be accomplished. 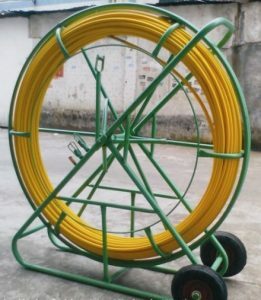 Although the glass fiber reinforced plastic duct rodder is a kind of tool that plays an auxiliary role in the pipeline rope towing work, the risk is far lower than that of the excited equipment, but every step of the process of using the duct rodder with safety Need to tighten this rope tight. The surface of the regular glass fiber reinforced plastic duct rodder Hebei are generally smooth and flexible, this surface design is not just for the beautiful, but also for safety and practical considerations was specially designed. Therefore, the general purchase of fiberglass punches are preferred when the surface is smooth. Secondly, in order to avoid the safety loss caused by the damage of the FRP duct rodder during the operation, the diameter of the perforator bending must be higher than 60 cm during operation, and the FRP perforator can not be over-pressed. Finally, it is not used under the unfavorable environment of glass fiber reinforced plastic punches. Such environments include the environment with extremely high temperature or extremely low temperature, continuous rainstorm, perennial wet or long-time direct sunlight exposure.